This is a simple, inexpensive and delicious dinner that we always ate when I was growing up. 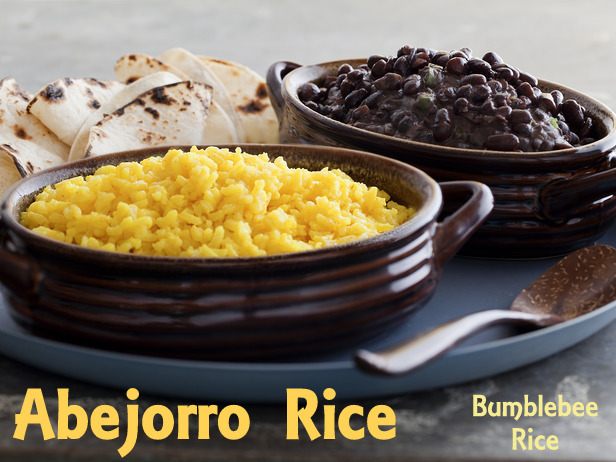 We just called it Black Beans and Yellow Rice, but I thought it needed a better name (or else we might just start naming our foods with adjectives and nouns… white chicken with yellow lemons…red melon with black seeds…). I named it Abejorro Rice because it seems like a Spanish dish, and Abejorro means Bumblebee in Spanish. Fitting, right? Saute the rice and 1/2 cup of the onion in the oil, over medium-high heat, until the rice browns. Add the turmeric and 4 cups of the chicken broth. Turn the heat down and simmer for 20 minutes, until the liquid is absorbed (you may need to adjust the amount of chicken broth depending on the type of rice you use). Meanwhile, drain and rinse the black beans. Simmer the beans with 1 cup of broth and the remaining onions (1/4 cup). Stir occasionally. Serve the beans over the rice and top with sour cream, salsa or hot sauce.